Adjustable telescoping handles for caregiver comfort. Durable vinyl upholstery. Treaded, flat-free tires for safe riding. Anti-tippers included. 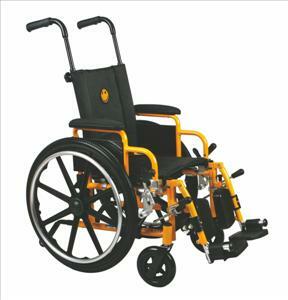 Standard dual axle allows for easy adjustment of seat height to hemi level. Padded and upholstered armrests and calf pads come standard. Flip-back arms. Arm style: swing back desk length permanent. Leg style: detachable elevating legrests. Seat size 14" x 12" (36 cm x 30 cm). 250-lb. (113 kg) weight capacity. Optional accessories: O2 Holder (item MDS85181U), I.V. Pole (item MDS85183), O2/I.V. Combo (item MDS85190), Anti-Fold Device (MDS85196K), Overhead Anti-Theft Device (item MDS85197K), Tinnerman Legrest Locks (item WCA806991).